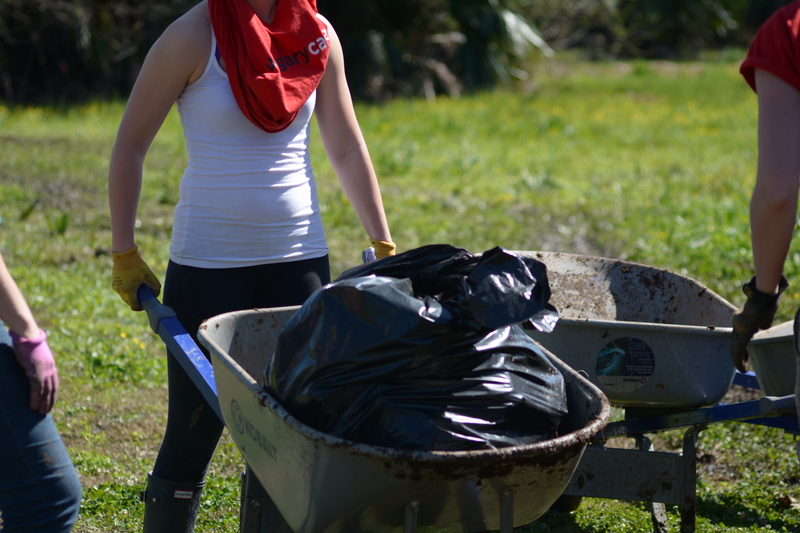 On Friday in New Orleans, our ucalgarycares team was faced with physical challenges and introduced to new cultural aspects of the city. We travelled to Grow Dat for the second time this week, bright and early in the morning. When we arrived, we were greeted with a task; to transport a compost pile from one side of the field to the other. Based on past experiences with volunteer groups, Leo, the Grow Dat employee directing our group, assumed that we would be able to move half of the pile before lunchtime. Normally, this task would have been reasonable but the farm experienced heavy rainfalls the night before and we had to work in muddy and swamp-like conditions. The Food and Justice team was able to surpass Leo’s expectations and almost transferred the entire compost pile to its new location. This was accomplished through the fantastic teamwork skills exemplified by every member of the team. Everyone was stepping in and helping each other out without being asked, encouraging words were being passed around to ensure that team members had the motivation to keep working and to make sure that each individual felt appreciated in an important contribution to the overall team. Instead of undertaking tasks out of necessity, different team members willingly offered to take on new duties and trudged through the mud with the last few wheelbarrows. When we had finished, our physical pain had manifested into strength, gratefulness and satisfaction in our team. We ended the day by weeding beds of lettuce and then harvesting a mix of greens for our salad at dinner. Before we left Grow Dat, Leo and other employees shared their gratitude for the hard work that we had done. The entire day made us realize how much volunteers like us are essential in fostering change through various community initiatives. The little tasks we accomplished with our time at Grow Dat seemed miniscule in the long run but Leo’s appreciation allowed us to understand our role in helping to sustain a healthy community. 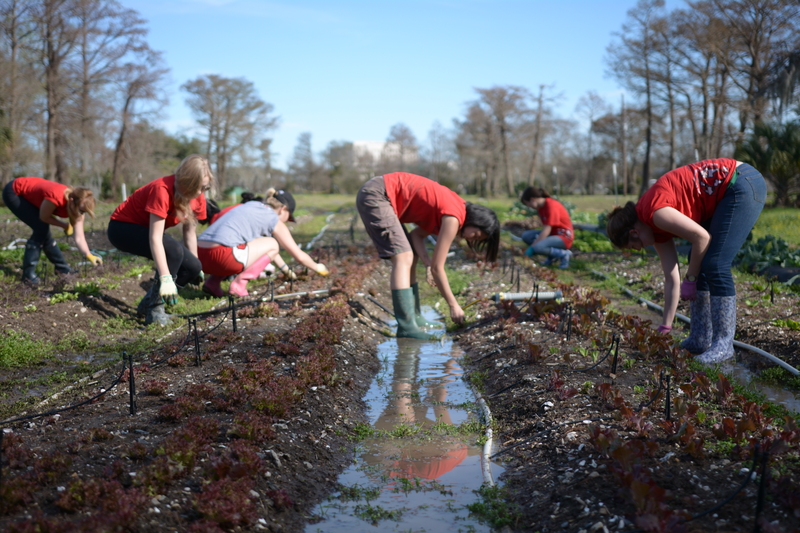 Harvesting kale at the end of the day was a special experience for many of our team members. It has shown us what it takes to feed a community. Contributing to the process of growing, maintaining, harvesting and consuming food that has come from a local and sustainable farm has provided us with an understanding of how agricultural initiatives can truly evolve to feed the nation in an approach that nurtures the connection between people and real food. We also had the opportunity to have a taste of Mardi Gras by attending the opening parade later in the day. We experienced the incredible culture of New Orleans by participating in catching throws, dancing to live music by local marching bands and watching the exquisite floats pass by. Attending this event helped us immerse ourselves in the authentic aspects of the New Orleans culture. This entry was posted in Food & Justice, Reading Week 2014 and tagged student post, ucalgarycares 2014. Bookmark the permalink.